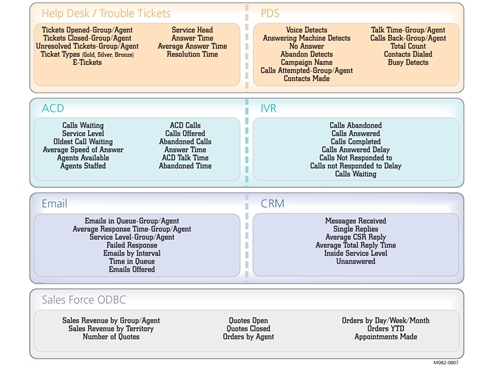 Call centers generate and store a tremendous amount of data, real time and historical. Unfortunately for most call centers this data is vastly underutilized and therefore loses its value to the organization. A Call center improved its adherence by 6% in 30 days when it started to display, in real time, the agent adherence to schedules. A contact center has an ACD, CRM, WFM, IVR, email, chat, IM, call recording and call accounting just to name a few of the solutions and products in use. Each of these solutions generates a lot of data that is stored and reused by the solution. Each of these solutions is able to produce individual reports for the manager. However, in most call centers these reports are rarely used because there are so many individual reports to review. In addition, the time it takes to sort out the valuable data from each report and create a summary report is overwhelming for most managers. This is a list of solutions and the data that should be extracted and used for real time and historical reporting. The top five call center solutions (data sources) that should be tapped for reporting and the advantages for reporting on that data. Multichannel ACD: The data from the ACD gives us a real time and for the day view of how the agents are performing and with respect to the goals set for the call center. This data provided to Managers, Team Leaders and Agents shows where the call center can improve immediately as well as in the future. Spectrum customers have reported up to 2% improvement in AHT by reporting ACD KPI’s to the agents. Workforce Management: Real time reporting on WFM metrics benefits everyone. Agents see the adherence, shrinkage and absenteeism KPI’s and are able to adjust their behavior to meet the goals that are set. A Spectrum customer reported a change in schedule adherence problems from 9% to 3% in 30 days by displaying the KPI to the agent desktop. CRM: Revenue, quotes, and general sales activity creates a competition with the sales agents in the call center. Senior management in most organizations wants to see revenue figures and especially large orders on a daily basis. A customer service call center using real time reporting has been able to increase the revenue of its bottom producers by almost 3% by creating a competition between its agents and displaying the real time status. Customer Satisfaction Surveys: While FCR might tells us how we think the call center is doing CSat surveys tell us what our customers think of us. External feedback that is shared provides the reinforcement management needs to encourage the call center team. In House Data: 40% of Spectrum customers have a custom built in house database(s) that contains some type of valuable data. Typically this data is something that has been generated for years and the call center has come to depend on it for daily operations. By sharing this data on a real time basis with the entire call center everyone benefits from the data. Call centers generate and store an enormous amount of data. This data when used by a real time reporting tool will provide direct benefits to the call center. Knowledge, opportunities and improvements are available and possible from using the data that is created by existing call center solutions. Spectrum customers report real savings and ROI when using real time reporting tools.